Yandere School – High school romance is considered to be the most treasured emotion because it originated from the carefree, not calculated from the students innocent, full of dreams. However, there are also opinions that the sentimental school children are crazy, cute and easy to fall apart. The sentiment of school years has left the emotional envelope, and also created a great source of inspiration for game makers to create games on the topic. And today, in this article, I would like to introduce you to Yandere School, a simulation game that exploits high school emotional themes. Let me discover the gift that the publisher of Tea & Cake Games brought today! Yandere School revolves around protagonist Akari Furutaka. She is a regular student at Yandere School. At one incident, she met Makio Sono on campus. Impressed with his handsome and cool personality, Akari Furutaka fell in love with him but did not have the courage to say so. One day, a new girl appeared, flirting and intending to steal someone whom Akari Furutaka crush on. Her instinct, not to lose Makio Sono, determined to fight for her love at all costs. Joining the Yandere School game, you will be portrayed as Akari Furutaka. Your task is to eliminate all the girls who are intent on flirting with Makio Sono. 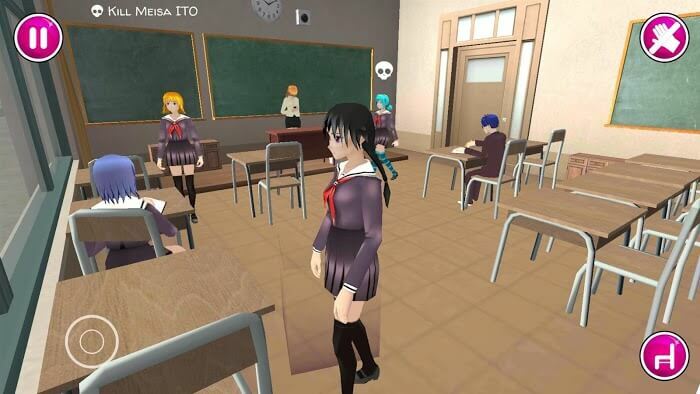 The scene of the game mainly takes place at Yandere School. You will meet and talk with Makio Sono, and also have to follow him, to know he is going to dating another girl. The system will inform you of the rivals that are appearing around Makio Sono, and your task is to kill all of them. On the map will appear weapons such as knives, hammers, shovels, sticks,… You pick them up to knock down all his rivals. However, you need to do this discreetly so as not to be discovered by anyone. Keep track of your enemies, as they go to solitary places such as toilets, corners, rooftops, or isolated areas, without anyone. About the control mechanism, the console includes a virtual home button, support for you to move, and a button with a hand icon, located at the right corner of the screen; you can use to pick up weapons, tons of enemies. Remember, after killing the enemy; you need to hide their identity in secret places and destroy the enemy so that no one knows you are the killer. If you let Makio Sono know, your love affair and he will no longer hope. Overall, Yandere School is a great simulation game, set in a school setting, highly rated for graphical quality and gameplay. However, some scenes in the game are quite violent, especially when you attack your rival. So you should consider before downloading this game.